Back-to-school makes the lives of everyone somewhat irregular, children and parents alike, but October is a "clean" month, with everyone practicing the guitar as much as possible. Right?! So that's enough storytelling, let's have a look at the most popular guitar lessons of October. 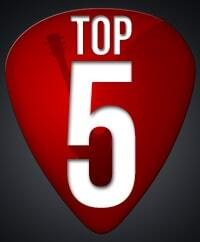 If you follow this series of posts, you'll know that I want to see the 5 most popular song tutorials, so if there are any basic guitar lessons in the top 5, I'll just expand the list to as many as it takes to show you 5 lessons on songs. This month, we have 4 basic lessons within the top 5, which means I'm expanding the list to the Top 9 tutorials of October. Actually, the top 4 spots are all basic lessons, which tells me that a lot of new players starting learning the guitar. Good on them, I wish them much success. Good ol' Santana doesn't disappoint, his famous song Samba Pa Ti is a favorite of lot's of guitarists (even though it has nothing to do with Samba, as the name would suggest). Santana is a favorite guitarist of mine as well, I follow him on Facebook, he writes really deep messages at time. Finally there is a Metallica lesson among the top 5, I've been wondering why more people don't learn Metallica. I have several Metallica guitar lessons up, so if you like their style, feel free to learn more songs. I don't have any plans to add more Metallica for the immediate future, but if you have any requests, write me or leave a comment below. Ring of Fire is consistently among the top lessons each month. A lot of people really like Johnny Cash, and who can blame them no? Again, if you want to see more Johnny Cash songs on the site, let me know and I'll see what I can do. Adele is another artist who is consistently among the top lessons of each month. Someone Like You is a wonderful song, it never gets old. I must have heard it 50 times already, played it that much as well, but it's still a great song I'm not bored of. So from here on, we can see that the most basic lessons stole the top spots of October, in the exact order they are designed to be learned. Basic Lesson #2 starts teaching chords, which is a huge step for beginners, congrats to all of you! The first Basic Lesson covers the fundamentals of learning guitar, the very basics like how to hold the guitar, and pluck a string. One of the first steps in learning guitar is learning how to read tabs, and this lesson teaches just that. All other lessons on my site use animated tabs, so if you can't read them, you're lost. That's why this lesson is always among the top lessons as well. Drumroll please... The most popular lesson of October is... the same as last month's 🙂 But seriously, just like the tabs learning lesson, it's important to know how to read chord charts as well, so I would expect that as long as beginner guitarists visit TheGuitarLesson.com, these 2 lessons will always be among the top lessons of every month. So in summary, I'm super excited to see this many students starting to learn guitar. Actually, I'm excited to see this many students starting out each month. To all you beginners, stick with it! Playing guitar is one of the best things in life. And to all you more advanced players, practice more, become great, and motive more beginners to pick up the guitar! Yeah!! !